Welsh Springer Spaniels are compact dogs with silky coats that fringe along the underside, legs and chest. They have small round heads and square muzzles. Welsh Springer Spaniels' ears are long and fringed with fur. 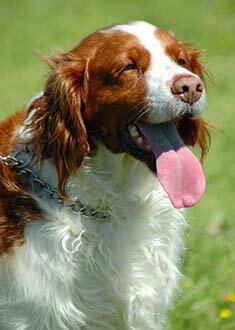 Welsh Springer Spaniel males are 17-19 inches (43-48 cm). Welsh Springer Spaniel females are 16-18 inches (41-46 cm). Welsh Springer Spaniels can be dark red & white. An average shedder, the Welsh Springer Spaniel requires regular brushing to keep its coat silky. Some trimming is in order between the toes. Nails should be clipped and this breed should be bathed when necessary. Happy willing and independent, Welsh Springer Spaniels are outdoor dogs and love to run, hunt, swim and chase. The Welsh Springer Spaniel is equipped for both hot and cold weather. Welsh Springer Spaniels make excellent family dogs and get along well with children. The expected life span of the Welsh Springer Spaniel is about 12-15 years. Welsh Springer Spaniels are very active and require lots of exercise, especially off the leash, to keep them from getting fat and lazy. Welsh Springer Spaniels are in the Sporting Group. Find Welsh Springer Spaniel Puppies with our Free Breeder search!